Gravity is a fictional story of how specialist Dr. Ryan Stone (played by Sandra Bullock) and veteran astronaut Matt Kowalsky (played by George Clooney) escape outer space after their space shuttle is destroyed by space debris while on a routine space walk. Before I start, I want to say before watching Gravity, other than it taking place in outer space, I had no knowledge of what it was about. I had never seen a single trailer. I just heard positive reviews from friends. I unfortunately ended up watching the regular film, and not in 3D. In short, I did not realize the movie was filmed specifically for 3D. After watching and looking into the details, I would absolutely watch it in 3D a second time around. 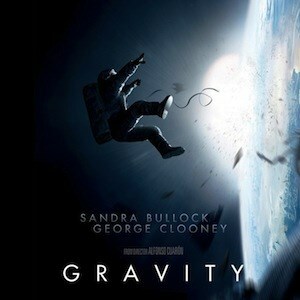 My thought is Gravity is a movie with long period of little movement. Given space is a very large and quiet place, it is understandable why there was so much floating around. This unfortunately reminded me all the running around in Lord of the Rings series, which was not my liking. The plot is straightforward and predictable, but nothing mind blowing. Additionally, the whole movie only contains three characters! I have unfortunately seen many films with a very limited number of character, and have gotten tired of it. But, the visuals were absolutely amazing! Even though TONS of CGI was required, the views of Earth from space were spectacular. I can only imagine it would have been twice as good in 3D. Also, my mind was wandering throughout the movie to try and figure out how they filmed the weightlessness. I would be very interested in the behind the scene footage. Overall, I doubt I would watch Gravity a second time, but really wish I had watched it the first time in 3D. I just don't think I sit through all the floating around and limited action. That being said, I would recommend it to friends, but make sure they watch it in 3D. And to be fair, I am biased toward action and thriller movies, but have recently enjoyed 3D movies like Avatar. Is it really feasible to float from space station to space station? If Dr Ryan Stone were floating, could she adjust her direction without any outside influence? When Matt Kowalsky died by detaching himself from Ryan Stone, he was stopped. Shouldn't a small tug by Dr Ryan Stone (out in space) sent Matt Kowalsky back? Can Dr Ryan really use a fire extinguisher to get her around in space? Can you really move around space by pointing?